Prisoners retain the essence of human dignity inherent in all persons. Respect for that dignity animates the Eighth Amendment prohibition against cruel and unusual punishment. The U.S. Supreme Court today heard oral arguments in Schwarzenegger v. Plata, the lawsuit over whether California must release prisoners pursuant to a court order as a step towards rectifying abysmal prison conditions in the state. A few weeks ago, Governor Arnold Schwarzenegger surprisingly announced a shift from spending on prisons to spending on education. Part of his plan was for increased use of privatized prisons (think Corrections Corp. of America.) He received a lot of praise for his new plan. Bump and Update: The proposal passed the California Senate today. It provides for the release of 37,000 inmates over two years and "includes measures such as house arrest and easing penalties for some crimes.."
A three judge panel in California has issued a "scathing" 184 page opinion ordering California to reduce its prison population by 40,000 within two years. The judges said that reducing prison crowding in California was the only way to change what they called an unconstitutional prison health care system that causes one unnecessary death a week. In a scathing 184-page order, the judges criticized state officials, saying they had failed to comply with previous orders to fix the health care system in the prisons and reduce crowding, and recommended remedies, including reform of the parole system. This sounds like a prelude to a scene out of "I am Legend" where Will Smith is the last man alive after a virus breaks out. 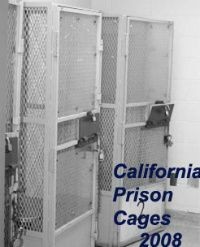 Only it's real, and it's happening in California prisons. In the past three years, more than 900 inmates at the prison have contracted [Valley] fever, a fungal infection that has been both widespread and lethal. At least a dozen inmates here in Central California have died from the disease, which is on the rise in other Western states, including Arizona, where the health department declared an epidemic after more than 5,500 cases were reported in 2006, including 33 deaths. It's not just inmates who are contracting Valley Fever which appears to be spread through soil in areas of the Southwest.